Asta, tell us a bit about your background and your projects so far. For context, let’s rewind a bit. I was a kid of the 70’s/80’s who didn’t really fit in with the cool kids and grew up on music videos, science fiction, and art… and though I didn’t initially show any affection for STEM related activities, I had a knack for pc and video games, and I eventually found myself in front of a computer designing digital art. Decades later, I graduated as a Graphic Designer from Parsons School of Design having no idea that the computer skills I came to love could be extremely useful for an entirely different industry. Upon my graduation, I immediately entered Microsoft Research as a Visual Designer. While at Microsoft I have had the opportunity to marry my love of art with my love of computers. The work I have done throughout my career has always been driven by my desire to create whimsical and meaningful experiences for people through technology. Some of these include temporary capacitive smart tattoos, wearable chemical sensors for environmental detection, GSR actuated clothing, and wearable light therapy for Season Affective Disorder (SAD). Quite by accident really. Wearable tech only came into focus for me about 10 years ago via a few publications and articles, but everything was still predominantly functional not so fashionable. At that time, I had already spent 10 years as a UX Designer and was starting to envision my next career when almost simultaneously, I came across an article about a “mood” dress from Philips Research. This dress could emote emotions through a color change detected from the wearer via a sensor. It blew my mind and transcended all it’s predecessors in a way that drove me to want to realize one of my own. I was so blinded by this desire, that I simply jumped head first into the world of physical computing. It was a leap of faith, and with support from management and much appreciated help from my colleagues, a year later, I created Microsoft’s first and only interactive dress known as the “Printing Dress”. The dress was steampunk in style and was made entirely of paper except for an acrylic interactive keyboard incorporated into its bodice. When the wearer “tweeted” to her skirt, her thoughts would animate on her skirt collecting into “memories” via a projector underneath. This dress went on to be featured at NY Fashion Week, CES, SXSW, and won best in show at the International Symposium of Wearable Computers. It was an incredible break, and it changed my life and career completely. I still look at it fondly and say, “Thank You”. I work within Microsoft Research so oftentimes, I have multiple projects happening at once, and in various stages of development. This requires me to work across disciplines and fields such as CS, Biology, Chemistry, Mechanical Engineering and Material Science, communicating and comprehending so that I can connect them all together through design. I have labeled this “Fusionism” and have created a title for myself and others of a similar ilk as a” Fusionist”. Additionally, because of the nature of Research, this requires me to be somewhat autonomous and ok with the ambiguous nature of the work we do because I am striving to predict or generate an experience from the future with only some predictable outcomes. Any new technology I attempt to develop requires some level of risk and courage because being early to the party doesn’t necessarily mean you’ll be welcomed or understood but it’s no fun being the last one to show up either. Currently working on building up a new initiative around Urban Innovation aimed at determining how urban density and climate change will impact the way we live by 2050. This came into focus for myself and a few of my peers who also shared the same concerns for our environment and some of the trends we were seeing. I’d love to tell you more, but you know…secrets. Additionally, our Artist in Residence program is revving up to reveal our latest Artist in Residence collaboration and we will be exhibiting some of our work at a few museums’ worldwide later this Spring. Projects come and go, but the time and emotional investment needed to establish and design new corporate programs which then become pillars for the next generation to stand on is how I would define an achievement. For this I have two. The first, and more recent is our Artist in Residence at Microsoft Research. Started in 2012, this inclusive program was very much a grass roots initiative designed to incorporate artists and creativity into our research community. I feel very strongly that creativity and the Arts act as a bridge to our humanity and I wanted to incorporate this into our process. The second program is Digigirlz, and it’s now lived to be 20 years old and has become a signature diversity program at Microsoft. Back in 2000, I, and some likeminded colleagues, realized how little, if any tech programs existed to promote and engage girls about STEM at an early age. We designed a four-day tech camp framework, partnered with willing employees and set off to change history. This program has now grown to become one of Microsoft’s signature outreach programs worldwide. I guess I always come back to the importance of inclusion and diversity. WomeninTech is one of many movements designed to challenge the current gender gap. While 51% of the world’s population is female, less than 20% are represented in the tech academic/industry worldwide. That means that almost all the technology you have ever experienced since its inception has been designed and driven through one gender perspective. 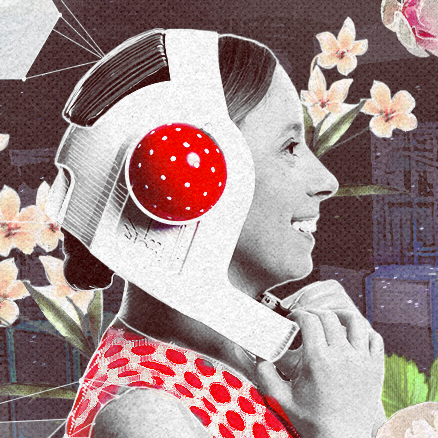 Can you imagine how the future of technology might be experienced if that should change? I think the Wearables Industry shows a lot of promise towards the promotion of experiences and devices driven by other genders, but currently, those numbers are still too few. Your voice, your perspective, your vision, your experience all shapes our collective future. If you don’t like the way the future is looking, it’s on you to actively engage with your peers and shift it even if that doesn’t make you very popular. This may require you to jump into an uncomfortable conversation or join a product team that may not look favorably at you. It may also require you have some ingenuity to navigate around established obstacles. You may not always break through, but the fact that you’re in there engaging and conversing behind those doors is what really matters. Worried about social injustice, climate change, data bias, disinformation? What are you waiting for? Continuous advances in materials and alternative power sources suggest that what we wear on our bodies will shrink and integrate more seamlessly into our fibers or on to our skin making it virtually “disappear”. The Wearable experience becomes more personal, intimate, and private rather than public and social. Also, rather than an all in one device, these tiny personal wearables may only be designed to provide one function and therefore require much less power making them more efficient and specific to the user’s needs. Technology becomes softer, more intimate, and ultimately more personal. The next generations may even opt to insert technology under their skin, or even swallow it becoming the first generation of augmented humans or living cyborgs and if you’re not familiar with living cyborgs…just search for Neil Harbisson and get ready to have your mind blown. Who are your 3 inspirational people / businesses in wearable tech and / or IoT? Helene Steiner (Open Cell, UK): Helene is a fellow “fusionist” and was a previous Artist in Residence here at Microsoft Research. Her most famous wearable “bioLogic” infused living materials into active wear as “second skin” enabling the garment to cool the wearer through biological response ventilation. She is the CEO and co-founder of Open Cell, a biohacking lab and multi-disciplinary community in Shepard Park London. Natsai Audrey Chieza (Faber Futures): Natsai is the founder of Faber Futures, a UK based biodesign lab pushing new narratives around sustainable materials solutions including color dyes generated by bacteria. Her work is very future facing, and largely inspired by sustainable and ecological solutions aimed towards a giant textile industry. I have been a huge fan of hers since I first saw her work back in 2013. Bichlien Nguyen (Microsoft Research | Quantum Computing): Bichlien is a chemist working on the future of Cloud and Data scenarios including ways in which DNA can be used to store data. As a colleague, we have worked together on a variety of projects including an exploration into wearable chemical sensors used to detect environmental hazards. I always appreciate her vision and insights and find our collaborations to be one of the most inspiring moments of the day. The WEAR Conference attracts the entire value chain in the wearables and smart fabrics space. From major sportswear companies to retail electronics giants, and consumer electronics companies to component and raw materials manufacturers, the WEAR Conference is the only place to market your product or services from a variety of industries, including textiles, technology, fashion, investment, and the military. 300+ Apparel product developers, component makers, fashion executives, senior managers, electrical engineers, investors, designers, medical device developers, textile manufacturers, lighting professionals, and R&D executives from a diverse range of companies (from athletic apparel to bedding to medical devices to underwear!) attended WEAR year after year. 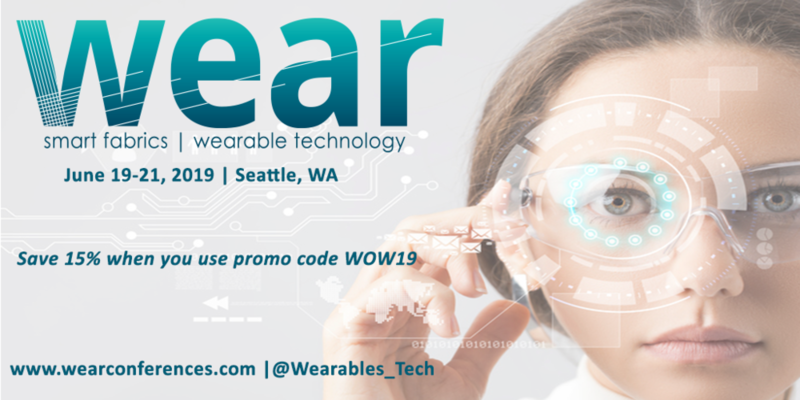 Women of Wearables are media and community partner for this years event, use code WOW19 for 15% tickets!